For the past sixteen months or so, it’s felt as though our planet has been shaking us by the shoulders, trying to wake us up to the fact that we’ve kicked the thermostat into overdrive. The good news is, America finally seems to be listening. According to a new report by the Department of Energy, wind and solar production took off last year as the price of clean energy technologies plummeted. Since 2008, the DOE has been tracking America’s clean energy output through a series of annual assessments. And our 2015 report card paints a rosy picture for what was the hottest year in our planet’s history. Wind and solar power, whose costs have fallen 41 to 64 percent since 2008, accounted for two thirds of all new electricity production last year. Other clean energy technologies, like grid-scale batteries and hydrogen fuel cells, are finally becoming advanced enough for practical use. 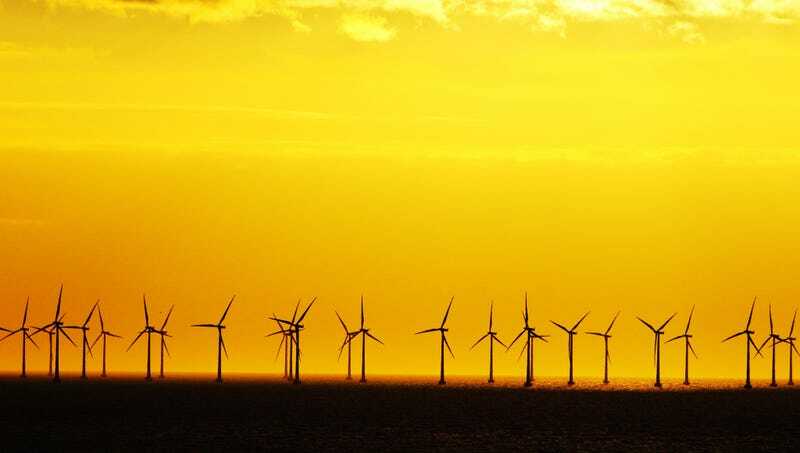 Land-based wind power is having a golden moment, with 74,000 megawatts (MW) of new turbines installed last year—enough to light up over 17 million households and save America 132 million tonnes of carbon pollution. All told, wind power production has tripled nationwide since 2008, now accounting for over 5 percent of our total electricity generation. 2015 also saw some big milestones for solar power, including the installation of the millionth rooftop photovoltaic (PV) system, and a surge in utility-scale solar farms, which now generate nearly 14,000 MW of power annually. And this is just the beginning. “The amount of utility-scale solar projects in the pipeline is truly staggering,” the DOE writes, noting that while it took decades to achieve 10,000 MW of solar energy production, the same amount of utility-scale PV might be installed this year alone. Much of this progress can be attributed to the falling costs of the aforementioned technologies, as illustrated by the chart above. But more basic research is needed to continue driving costs down and help clean energy expand further. In particular, the DOE report highlights the need for aggressive expansion of grid-scale batteries that can store extra electricity produced on windy or sunny days for another time. Other emerging technologies, like smart building controls and fuel cells, are also expected to slim down our carbon footprint once they’re ready for prime-time. Which brings us to a sobering reality. America is going to need to do a lot more to wean itself off oil, coal, and natural gas. The trends in clean energy growth are encouraging, but we aren’t yet moving fast enough to reach our short-term carbon commitments stipulated in the Paris climate agreement, much less eliminate fossil fuels entirely by the late 21st century. And make no mistake: whether or not we can build on our current momentum to achieve a lasting energy transformation is entirely dependent on the outcome of the 2016 presidential election, which contrasts a candidate who wants to expand on Obama’s Clean Power Plan with one who wants to “unleash” American coal production. The choice before us has never been more stark.